Why Is Jack Ryan Still President? 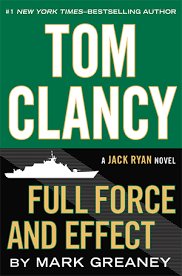 I saw the newest Jack Ryan novel and last book I finished was Debt of Honor. I just could not get into Executive Orders where he becomes president and that was it with Tom Clancy books plus Clancy was a republican and neocon. I do think he should be credited with starting the whole military technoporn genre. I noticed the latest book when at B.Js Wholesale and Jack Ryan is still president. Its over 20 years. Are the books stuck in the 8 year presidency? His earlier books covered a far longer timespan. Or did Ryan somehow got the presidential term limits done away with? Any Clancy readers? Anyone familiar with Greaney who appears to have taken over the series since Clancy died a few years ago.